Prime Minister Narendra Modi visited Varanasi with French President Emmanuel Macron. Varanasi: French President Emmanuel Macron arrived in India on Friday on a four-day visit. On Saturday, India and France had inked 14 pacts, including in key areas of defence, nuclear energy and protection of classified information besides resolving to boost cooperation in the Indo-Pacific region, with PM Modi asserting that the synergy between the two sides was from "land to sky". DLW is Varanasi's industrial identity. Indian government is committed for its continuous development and upgradation, says PM Narendra Modi at a public rally in Varanasi. Yogi ji took special care of the need of farmers, I am happy that there has been four-fold rise in selling of farm produce, says PM Modi. Yogi government worked on housing scheme for all like a campaign, I congratulate him for the same, says PM Modi. India and France have joined hands to work in the field of solar energy, says PM Modi in Varanasi. Long pending demand of a train betwen Varanasi and Patna was fulfilled today, I thank Rail Minister Piyush Goyal for the same, says PM Modi. It is my privilege that I got the chance to launch several initiatives for the development of Varanasi, says PM Modi. 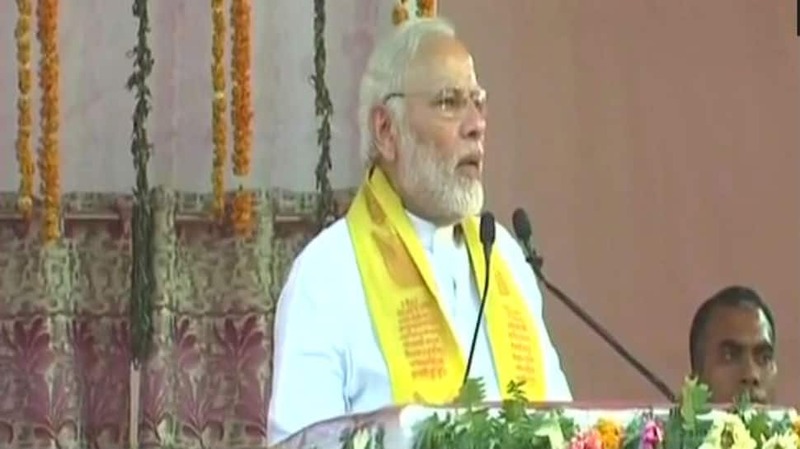 PM Modi and Macron visit Deen Dayal Hastkala Sankul in Varanasi.